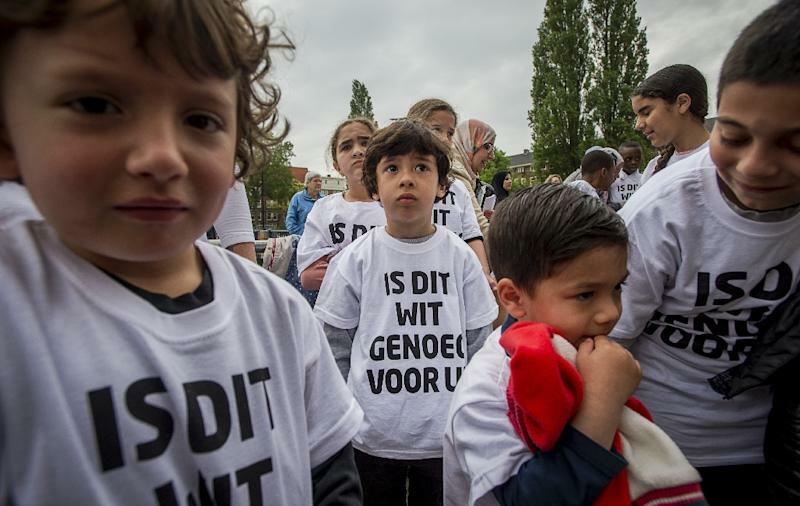 Amsterdam (AFP) - Faced with an increasingly segregated education system, Dutch immigrant children have taken to the streets of their ethnically mixed Amsterdam neighbourhood seeking "white" pupils to attend their schools and help their integration. Around 100 schoolchildren -- Arabs, Turks, Africans, Moroccans -- accompanied by their parents and teachers, wore provocative dazzling white T-shirts emblazoned with "Is this white enough for you?". 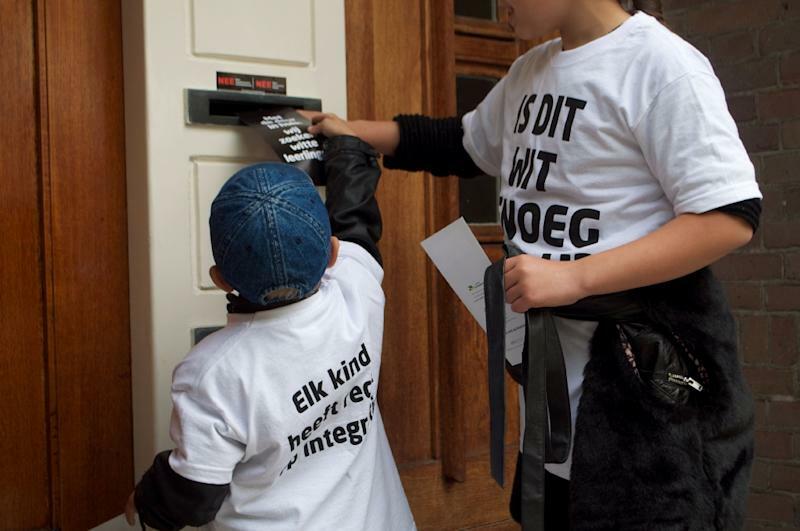 Dutch native Annelies, 10, and immigrants' daughter Aminata, 11, have been friends since kindergarten and are also wearing the shirts, which have "All children have the right to integrate" written on the back. They "want more white children in the school to learn about each other's cultures," said Aminata, her smiling face framed by dangling African braids during Friday's protest. "It's important for later," said the blonde-haired Annelies. "When we're grown up we will have to deal with different cultures, we should already start learning to live together." "At the moment there's only one boy in our class who is 100 percent Dutch, although we live in a mixed neighbourhood, it's ridiculous," she said. The pupils' two schools - De Avonturijn and Catharinaschool - are considered "black" in this ethnically mixed southern Amsterdam neighbourhood, as more than 90 percent of their pupils are from immigrant backgrounds. The number of new pupils signing up continues to drop and the schools are now threatened with closure, so today they're going door-to-door, ringing doorbells and delivering flyers saying "We're looking for white pupils". "When, for different reasons, a school 'becomes blacker', it's very difficult to reverse the trend," said Diane Middelkoop, spokeswoman for the two schools. "White children's parents no longer want to be part of the school. I can understand that: we all want to feel at home and that means that we want to see people who share our origins and culture," she said. "It's racism and I'm ashamed. There was always a bit of racism in this country, but today it's serious, it has to stop," she said. At the other end of the street, florist Wim Barlag has worked here for 50 years, has a son at one of the schools and has a different explanation. "More and more families are leaving, making way for students -- the problem is there's simply not many children left," he said. The Netherlands has a reputation for tolerance, but racial tensions and discrimination are on the increase. "I want my children to be integrated in Dutch society and to learn about different cultures," said 35-year-old mother and housewife Majda Khatibi. The Netherlands calls on immigrants to take part in Dutch society, through work or study. Once they have learnt the language, they must take an integration exam to make sure they fit in Dutch society. As immigrant numbers have risen, so has the popularity of far-right politicians, including anti-Islam politician Geert Wilders who criticises immigrants for not integrating enough.